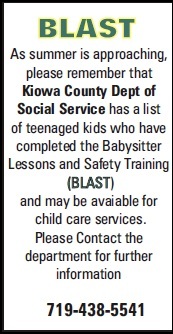 As Summer is approaching, please remember the the Kiowa County Department of Social Service has a list of teenage kids who have completed the Babysitter Lessons and Safety Training (BLAST) and may be available for child care services. Please contact the department for further information. 719-438-5541.